Dutch physicist Hendrik Lorentz refined James Clerk Maxwell's theory of electromagnetic radiation to explain how light is reflected and refracted. He was adept at basic mathematics by the age of six, and mastered logarithms by nine. He studied at the University of Leiden and was named Professor of Physics at Leiden when he was only 25. To explain the relationship between electricity, light, and magnetism, he proposed that atoms and molecules carry either a positive or negative charge, and that oscillation and light are produced by these charged particles. In 1895 he described the Lorentz force, the effect of charged particles in an electromagnetic field, and he coined the term electron in 1899. 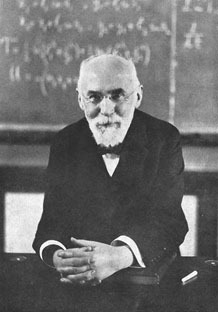 In 1904 he calculated mathematical formulas, now called Lorentz transformations, to show how one observer's space and time measurements are related to the observations of a second observer who is moving (relative to the first observer), a work expanded by Albert Einstein into his special theory of relativity. Lorentz explained the splitting of spectral lines in strong magnetic fields, as first observed by his student Pieter Zeeman in 1896. Lorentz and Zeeman shared the second Nobel Prize in Physics in 1902.